Local delivery of therapeutic nanoparticles to the lung is an ideal method for treating various lung diseases, including cystic fibrosis (CF), asthma, chronic obstructive pulmonary disease (COPD), and lung cancer. However, there are many barriers to overcome, including the mucus lining that protects lung tissue. This mucus layer is cleared as often as every 10 to 20 minutes, resulting in clearance of inhaled materials, including medications and nanomedicines, reducing effectiveness. The mucus barrier in chronic inflammatory conditions, such as CF, is an even more significant barrier to drugs and therapeutic genes that need to reach the underlying tissues. We found that clinically-tested gene carriers were trapped in human CF sputum obtained from patients with CF, indicating that the therapeutic gene could never reach the cells that need it. However, recently, we demonstrated that our gene carriers that can penetrate CF sputum (mucus-penetrating particles, or MPP) have increased lung retention and deliver genes uniformly to respiratory tissues. MPP gene carriers are a promising platform for treatment of CF and other lung diseases. We are currently working on similar strategies to improve treatment of other respiratory diseases, including lung cancer and COPD. Mastorakos P*, da Silva AL*, Chisholm J, Song J. Choi WK, Hanes J#, Suk JS#. (2015) Highly compacted biodegradable DNA nanoparticles capable of overcoming the mucus barrier for inhaled lung gene therapy. Proc Natl Acad Sci U S A. 112(28):8720-5.
da Silva AL, Martini SV, Abreu SC, Samary Cdos S, Diaz BL, Fernezlian S, de Sa VK, Capelozzi VL, Boylan NJ, Suk JS, Rocco PR, Hanes J, Morales MM. (2014). DNA nanoparticle-mediated thymulin gene therapy prevents airway remodeling in experimental allergic asthma. J Control Release. 180:125-33. Suk JS*, Kim AJ*, Trehan K, Schneider CS, Cebotaru L, Woodword OM, Boylan NJ, Boylan MP, Lai SK, Guggino WB, Hanes J. (2014). Lung gene therapy with highly compacted DNA nanoparticles that overcome the mucus barrier. J Control Release. 178:8-17. Schneider CS, Xu Q, Boylan NJ, Chisholm J, Tang BC, Schuster BS, Henning A, Ensign LM, Lee E, Adstamongkonkul P, Simons BW, Wang S-Y, Gong X, Yu T, Boyle MP, Suk JS, Hanes J. 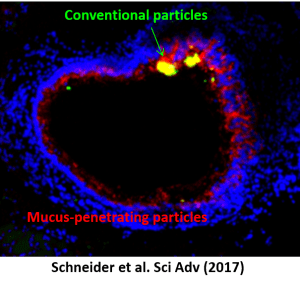 (2017) Nanoparticles that do not adhere to mucus provide uniform and long-lasting drug delivery to airways following inhalation. Science Advances. 3(4):e1601556.